Brad began playing handball at the age of 12 and by the age of 15 became the under 15 Ontario Junior Champion in Hamilton, Ontario in 1981 Since then, he captured the Ontario Senior under 15 championship, Junior under 17 championship and the Senior under 17 championship. Brad quickly progressed from Provincial to National Competition reaching the finals in the under 17 championship in Edmonton. 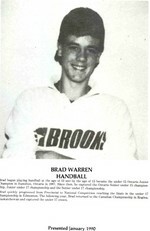 The following year; Brad returned to the Canadian Championship in Regina, Saskatchewan and captured the under 17 crown.